The club was founded in 1986 by Philippe Quoilin the Juggler, and roughly a total of 4,000 jugglers have attended at one stage or another. Philippe passed the Juggling Club onto Jess Pierce who ran it for a few years until she had her son Zenith. 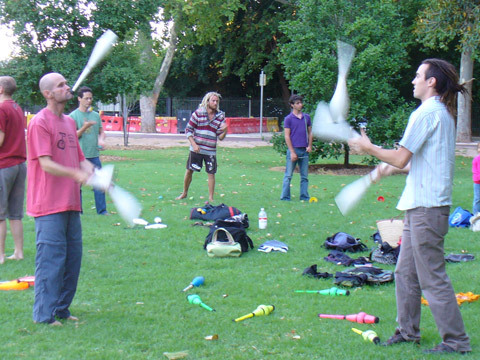 Ben now runs it with a community of jugglers and like minded people who enjoy the Zen art of juggling and play. Description: Plenty of indoor and outdoor space. There is also a new circus school called Lolly Jar Circus who caters for people with disabilities but is open to all young people in general . Classes are on Wednesday evenings 5.00pm to 6.15pm and 6.30pm to 7.45pm. School Terms only.